The Sword in the Stone would have you believe that when magicians have differences, they settle them through a Wizard’s Duel. But don’t be fooled. Wizards are a more peace-loving folk, and when they want to see who’s the best at sorcery, they play a game of savvy hand management, set collection, and bluffing. So, Hocus. 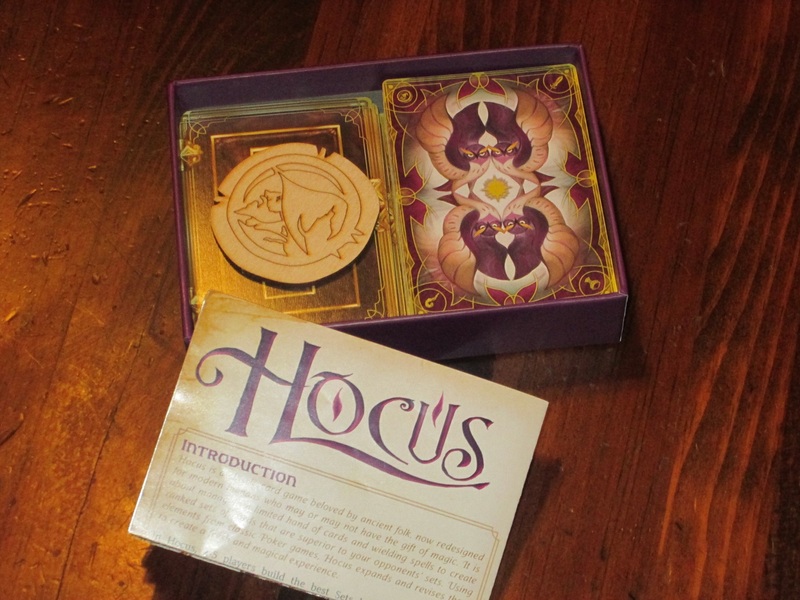 Hocus is a hand management card game for two to five players. 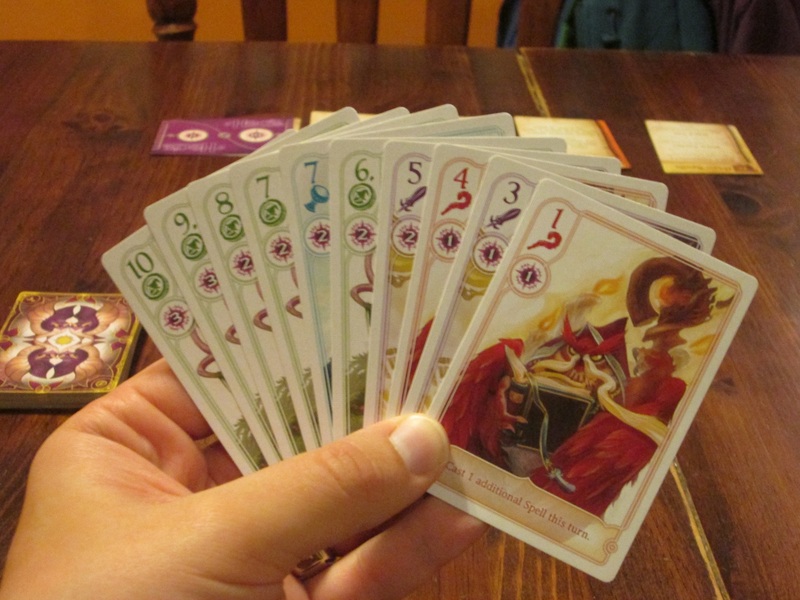 Players are wizards in a card game tournament, each with their own spell book, trying to win the most points in pots. The player with the most points when someone hits 25 points is the winner. Hocus set up for three players. To begin, each player receives a unique spell book with the three advanced spells of that type. The deck is shuffled, each player receives a hand of cards in four suits, and a start player is chosen. On a turn, players may perform one action, and in addition may use one owl action (if they won any owls in the previous round). 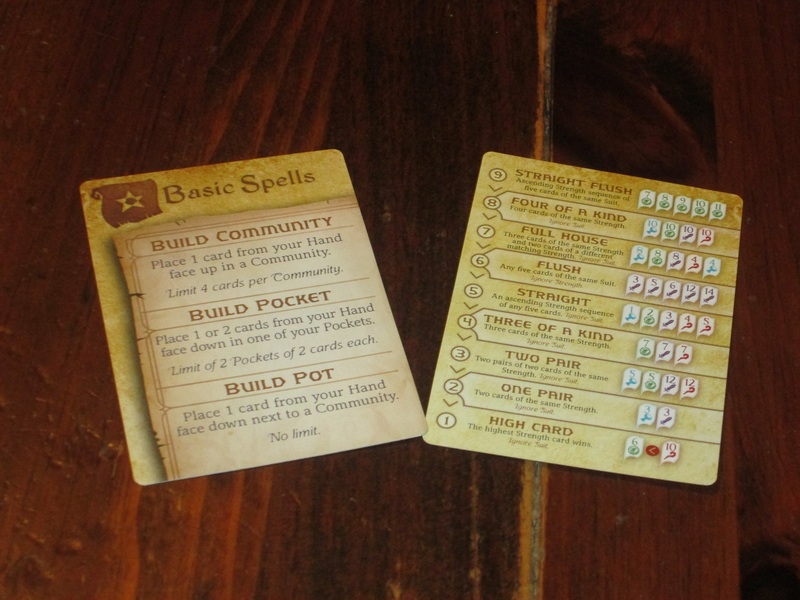 Actions are either basic spells (add a card to one of the two communities, add a card to a pot, or place one or two cards into a personal pocket) or advanced spells (unique player abilities that usually involve some combination of basic spells). The round ends after both communities have four cards and each player gets another turn. The four suits in Hocus. They are the same except that each owl card has a special ability. The goal is to win the showdowns at the end of the round. Each showdown happens at a community. The community is a set of common cards that players combine with their pockets to make the best Poker hands (similar to Texas Hold ‘Em). Each player may assign one pocket to each showdown. The player with the best hand wins all the points in the pot associated with that community. The player who wins a showdown also collects any owls placed in the pot as special actions for the next round. The game ends when, after a round, at least one player has 25 points. The player with the most points wins. 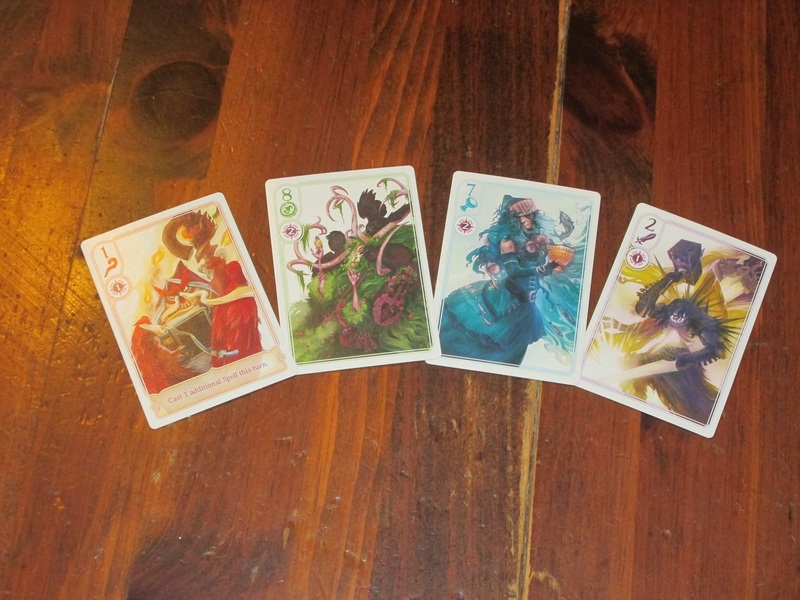 I previewed Hocus in 2015, and after playing the prototype, I backed the game on Kickstarter. Now that I’ve played the finished game several more times, I am convinced: Hocus is one of the best value-for-the-money card games on the market. A sample hand in Hocus. So. Many. Possibilities. And even with all those green cards, exploiting them can be tough. 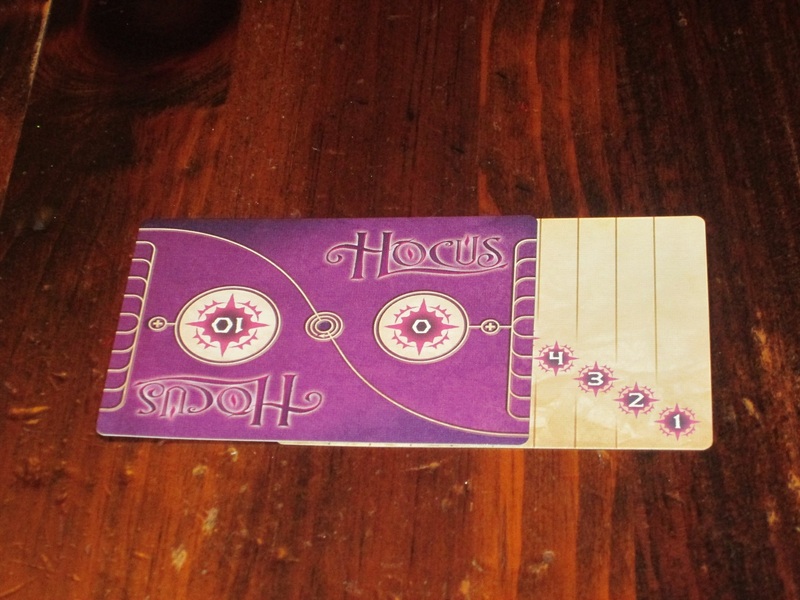 Hocus is a hand-management puzzle, essentially, where players have to work against a scarcity of actions. They can do only one thing each turn, and by doing that one thing, they restrict the possibility of doing anything else they need to get done. Adding a card to a community seems like a good idea, but if you do that, you can’t add points to the pot of the community you’re influencing. (You’re also pushing the round toward its end, which is restricting how many turns you have left.) If you add points to the pot, you’re making the community worth more while also allowing other players to steer the community in a direction more favorable to their cards. If you play your cards to a pocket, again, you aren’t influencing points or the community, but you need to have a pocket in order to win a showdown. Yet you have to do something each turn, so Hocus is a game of trade-offs: each turn you have to find the one thing that will benefit you most and that will keep you in a good position for the next round, even if the other players do something that isn’t agreeable to your plans in the meantime. A community is only as good as its pockets and pots. Even if you have the best hand imaginable, it won’t be worth anything unless you can seed the community with your cards and then claim it with a pocket. So the game presents you with a huge task. Thankfully, it also gives you the tools to feel clever in figuring out how to spin the game to your advantage. There are eight different spell books in the game, each with three distinct spells. That’s a lot of variety, since each book plays completely differently. The classic game on its own is interesting, but I think Hocus truly shines through its asymmetrical player powers. 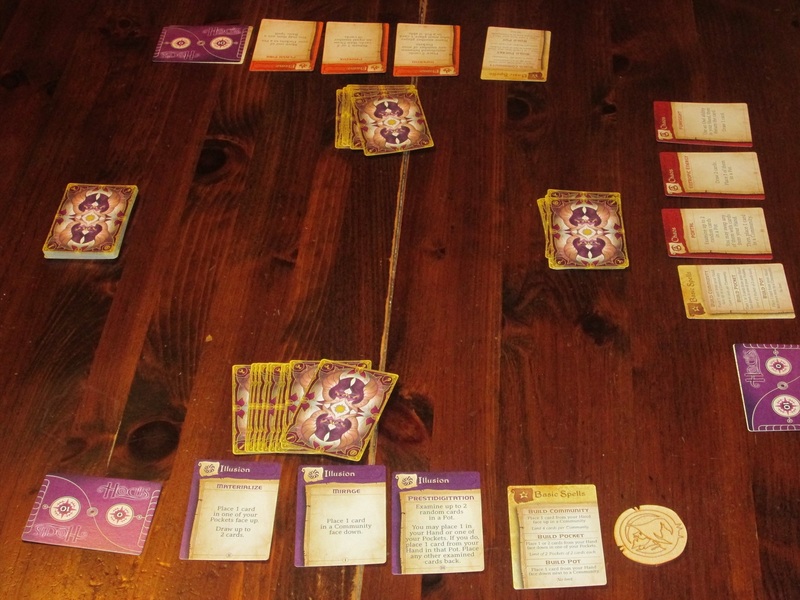 At the start of the game, each player receives three spells that are from the same spell book—essentially, three unique actions a player can take in addition to the standard ones. These unique actions are powerful, but they usually come with more uncertain trade-offs. One, for example, might have you draw three cards, but you immediately have to allocate those cards to different areas of the board. Or you might be able to examine cards in a pot and exchange them with cards in your hand—at the expense of not moving you any closer to victory. Again, these asymmetrical spells are the tools to help players feel clever, and they also add spice to the game. Here are the three spells for the illusion spell book, for example. And each spell book feels entirely different. In a recent game, I was playing with the Chaos book, a book I hadn’t used before. 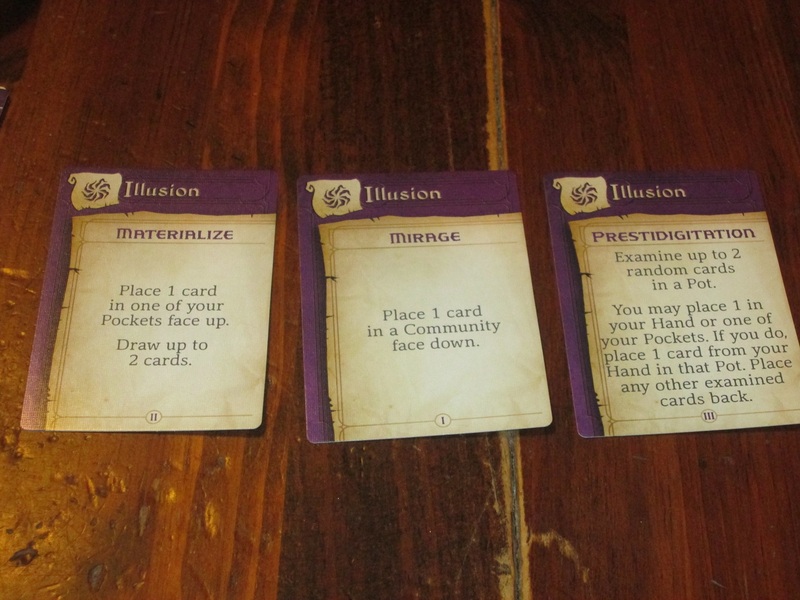 Whereas when I was using the Illusion book, I took more of a lead in placing cards in communities, when I played Chaos, I spent much of my time influencing pots. The “Portal” spell, for example, let me look at random cards in a pot and then swap them with cards in my hand, and “Entropic Energy” let me draw cards, placing at least one of them in a pot. I used “Foresight” to play an owl card I hadn’t earned, forcing the other players to place cards in pots, and then I used “Portal” again to see if those were the cards I needed. By controlling the pots in this way, I was able to find the cards I needed to make four of a kind in one of the communities, and I was also able to seed the pot I was winning in with high point value cards. This was enough to give me the edge to win big that round. I found this fascinating, because in my other plays, I hadn’t manipulated the pots very much. But just by switching out the advanced spells, I had to entirely change my strategy. I could have played as if I were playing the classic game, which is played without the advanced spells, but the twist of Hocus is exploiting the spells you have and the cards you’ve been given better than everyone else. The player aids are helpful for reminding players of what’s possible. If I’m making it sound like Hocus is thinky, that’s because it is. It takes a hand or two to fully wrap your mind around what the goal of the game is, and even then, you may not have a full handle on ideal strategy. For me, this is a huge plus. At the start of this review, I called Hocus one of the best value-for-the-money games on the market, and I stand by that. Besides having to become familiar with the game’s elements and strategy, there is a psychological element too: you have to read why the other players are playing their cards as they are, and they have to read why you’re doing what you’re doing too. Hocus is not multiplayer solitaire, and while it doesn’t have the inherent bluffing of Poker, it does leave lots of room for players read and mislead their opponents. And I think this is where longevity in a game is found. While variable setup (and even asymmetrical powers) are nice to include, I don’t think they ultimately and inevitably lead people to play a game over and over. The real reason people want to play a game again is because it tickles their brain in a strange way or because it fosters good interaction at the table. And I think Hocus delivers on both of these points. All of this game fits in a small box. This is great for shelf space, but it can frustrate players’ expectations. I think the worst thing I can say about Hocus is that it falls in a strange niche, so finding an audience for it may not be easy. It’s a game that includes only cards, but it’s not as simple as, say, Circus Flohcati. This is a thinky game that rewards replay. It plays quickly, but it’s the kind of game that you can explore and explore and explore and still find new depths in. Its small-box packaging and tiny price should be a strength, but I find that when I’m looking for a filler game, I’m usually looking for something lighter, and when I’m looking for a more strategic game to fill a lunch hour, I’m looking for a bigger box. This is shallow, and I recognize it as shallow, but it’s a shallowness that’s hard to overcome. As far as thinky fillers go, this is one of the best. It’s just a difficult niche to be in because Hocus doesn’t fit neatly into player expectations. The other expectation that’s hard for some players to overcome is the asymmetry in the game. Asymmetry is a double-edged sword. Many people tout its virtues as a way to provide a game with replayability and interest. But for as many as claim that they love it, I’m not convinced they do, and Hocus is a good test case. Each spell book in the game plays very differently. They don’t feel at all similar to one another, and the asymmetrical player powers have a huge impact on the game when used to their fullest. So if one player opts to ignore one or all of their powers, or not use them to their potential, chances are they will lose against players who are maximizing theirs. This isn’t a problem with the game, but some powers are more readily understandable than others, and thus they’re easier for beginners to exploit. Again, Hocus is the kind of game that rewards replaying, and I’ve been impressed with the balance of the powers. But be advised: whines and complaints about balance come with the territory of almost any asymmetrical game, and they are bound to come here as well. 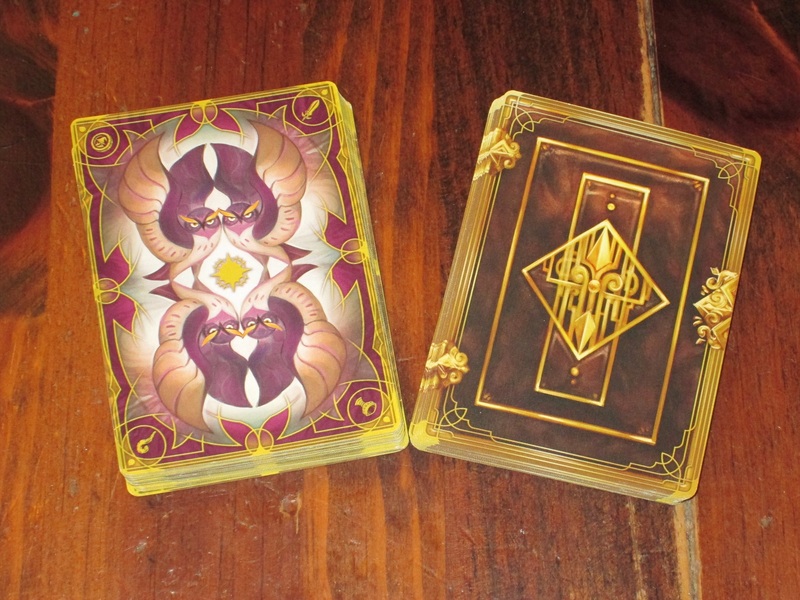 The score cards are a great solution for keeping everything you need inside the Hocus box. The components of Hocus are excellent. The cardstock has a great linen finish, and the design is clean. The artwork isn’t my style, but it’s well done for what it is. The score cards are a great “fix” to avoid needing a paper and pencil. The box is sturdy. 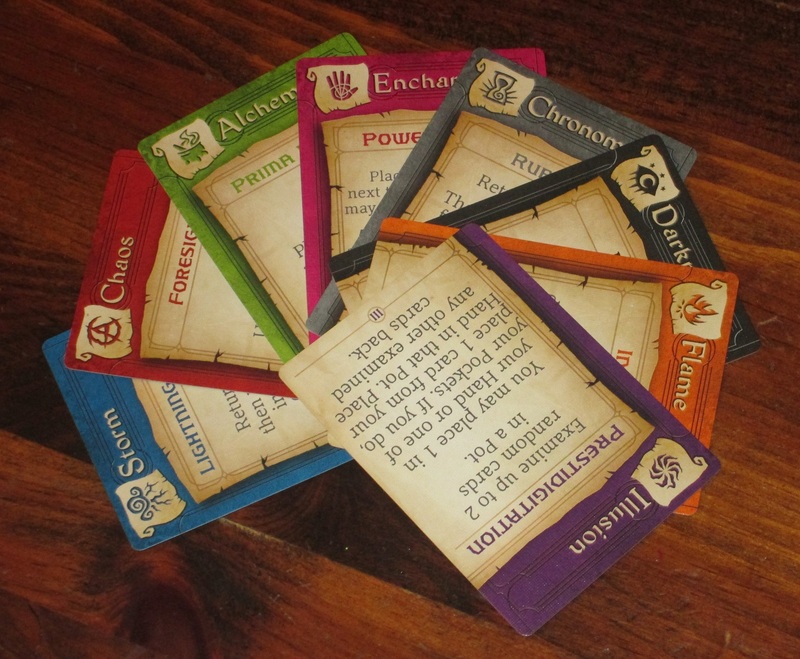 And I love the player aids, which in addition to laying out the hierarchy of winning hands also include the basic spells that players can use. All this to say, I have zero complaints with the physical components of the game. The game boasts play with two to five players. All my games have been in the middle of this play count—with three and four players—and I’ve enjoyed both counts quite a bit. The game plays quickly, and while playing to keep score between rounds is probably my favorite way to play, it’s also enjoyable if you have just a few minutes and want to play a single hand. Hocus is adaptable and can fill any spaces in your game night—it can act as a short appetizer, or the gameplay is interesting enough (and the game gets better the more you play it) that you could play for an hour or more if that’s the time you have available. Hocus is adaptable in a way that not many games are. Even the backs of the cards are beautiful. I think Hocus is an incredibly clever game, and quite fun to boot. It’s the kind of game where players always feel one step behind, and I like it that way: it presents players with a clear set of limitations and challenges them to make the best of what they’re given, to turn the puzzle to their advantage. I think the game is good using the classic or standard rules, although I prefer the standard rules that bring in the asymmetrical player powers. 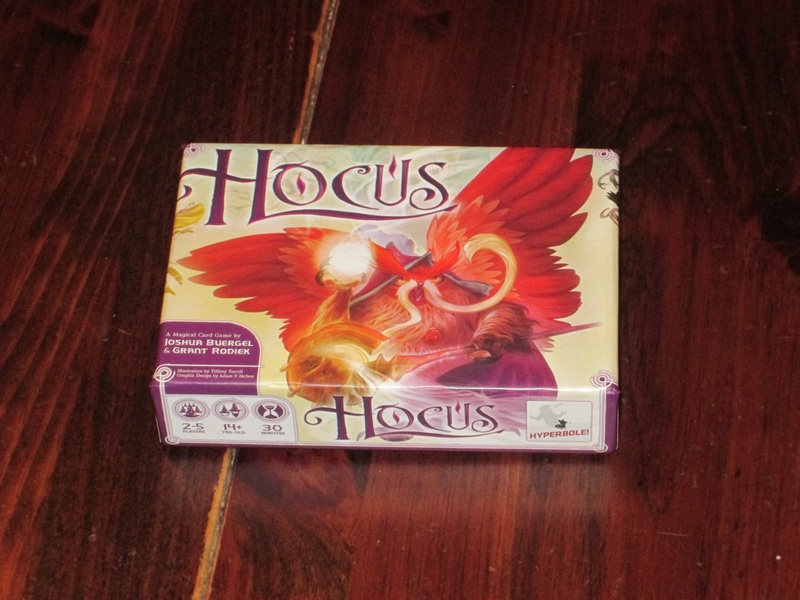 Hocus is an excellent buy, packing a ton of game into a small package. 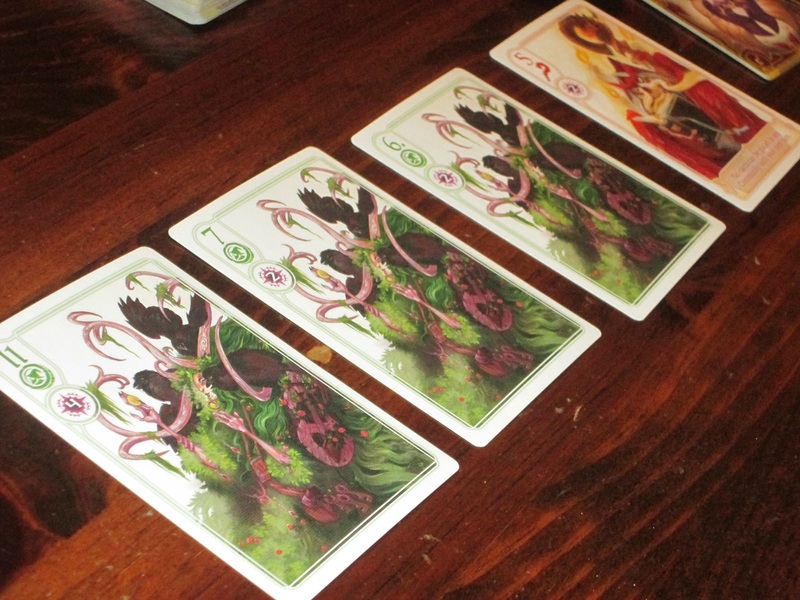 If you like short and strategic card games, you are bound to see the magic in Hocus. iSlaytheDragon.com would like to thank Hyperbole Games for providing us with a copy of Hocus for review.